If I can’t gain the trust and respect of the people that don’t understand how they are harming the environment, then I can’t do the work anyway. 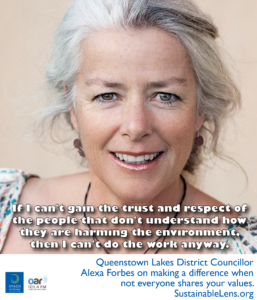 Alexa Forbes is a researcher and development and sustainability advisor for Otago Polytechnic’s Centre for Sustainable Practice. She is a District Councillor for the Queenstown Lakes District Council. She is a musician, a journalist and founder of a successful communications business. We open the conversation with her context – where did you grow up, what did you want to be when you grew up? It turns out that Alexa has a colourful background with a lot of stories so it takes longer than usual to get to what she is doing now. I’ve never really been on much of a mission – things just happen. Where did sustainable practice come from? I’ve explored that recently – I’m studying for a Master in Professional Practice – it comes from my childhood. An interesting childhood, I come from a doctor and an activist, artist musician mother. A lot of environmental concerns built in really early in my life. We were always in the bush, camping, tramping, learning to fish, to hunt – learning to be careful of the environment, to respect it, and to try not to damage it and to be part of it – that was always important. There were campaigns – take only photos, leave only footprints – and I thought these were feel good, but a lot was being left, damage to our ecosystems that was not being acknowledged, not being addressed. I’ve sat in rooms with tourism leaders when I’ve challenged them on environmental impact, and they’ve looked at me like I’m mad and said “we love this environment, we make a living from this environment, we would never hurt it”, which tells me something about the massive amount of ignorance. But I wouldn’t get very far by telling them that, clearly, so I have to be quite careful and unpick some of the knots in people’s thinking. I’ve never considered myself a greenie – I just think I’m sensible, and a good mother. Do I need them to vote for me? We if I don’t, I don’t get in and I can’t continue my work, but that doesn’t really concern me either, because if I don’t have their buy in then I can’t continue my work anyway. I feel that I’m better off on inside than outside. (Compromise?) I operate from a set of values. I don’t know – none of us know – whether we’ve gone past the ability to retrieve or regenerate ecosystems to a level that they are still friendly to humans, we don’t know if we can managed that or not. But concentrating on recycling schemes and changing lightbulbs is pretty much just rearranging the deckchairs on the Titanic. I’m an activist in that I try to get people to recognise and to question what they are doing. That’s what I want people really understand – when you are doing what you are doing, how are you thinking about mitigating the costs that you are putting onto your grandchildren? That’s a line in the sand, people should know that I won’t move from that. We’re still very head-in-the-sand in New Zealand, we still believe the 100% Pure. We can still pull that wool over our own eyes. None of us has come up with how we can do this quickly enough to make a difference. I have to operate from my values in the most pure way that I can. It disappoints me that our government refuses to take responsibility – I don’t know what they are thinking. Making it worse in so many ways. Allowing the dairy industry to externalise its costs. All over the country ratepayers are paying to clean up after the dairy industry – it’s not good enough. It appals me, I can get really angry, or I can go back to my own values, and say I’m not going to allow traffic to increase in Queenstown under my watch. (Can Councils deliver intergenerational equity?) It’s the only vehicle we’ve got. We (with Ella Lawton) stood for Council because we thought it was a place we could make some change. I think we’re making headway – enough for me not to have thrown up my hands in horror. I don’t concern myself with whether I’ve got a job tomorrow – I’m quite capable of going back to my old job – and frankly, Council pays a lot less – so it’s not about that. Here we are, sitting in this amazing nexus of change – exponential change in technology and exponential change in our environment, and in that nexus we face exponential social change. Every thing is changing so fast technologically, everything is changing environmentally much faster than we expected, much faster than we ever thought it would, so it is making us socially incredibly uncomfortable. I’m one of those people that think that technology will save us if we let it, but we have to change – we have to understand our true natures. Part of that for me was understanding our waste. (Success?) I just got a distinguished alumni award from Otago Polytechnic. Selling my business and being willing to embark on a new Masters and a a new career. (Motivation?) I love life. I really do love life. I love my work with Otago Polytechnic, and I love my work with the Council. (Activist?) I’m starting to be. I didn’t think I was, but I am starting to think that I am now. I try to keep it low key. I’ve only just realised that my opinions are a bit more radical than most people. I though that most people thought like me until quite recently, so now I’ve become a bit more outspoken – I didn’t realise that it was unusual. So I’m comfortable with that box – I’m an activist on the inside really. I like to stir people up and challenge their thinking. I don’t want to hurt them, and I don’t believe that I’m always right. My own thinking needs challenging, and I don’t want to take hard and fast positions that force people into corners because it’s not helpful and I might not be right. I go for a consensus model, but I’m not sure that’s right. Looking back on the last three years we’ve always gone for consensus…but I think it has watered some things down too much. That’s a hard one. When you vote against something, personally you’re counted as voting against that and that may have some personal benefit, but – and this is why I’ve gone for consensus, are you better to just go a little way along the way, to put the shot across the bow, planted the seed, let’s move on. So in the past…once it is lost…let’s make this the best it can be, but I’m not sure that it is always right. (Miracle?) People will have woken up to the environmental challenges and to their externalisation of costs to the next generation, and that the y want to educate themselves to stop doing that. (Advice?) Please wake up, look at what you do and ask “am I putting costs onto my children and grandchildren by doing this? How could I do thins properly? And it’s not just about recycling. Look at yourself, look at the way you live, look at why you are, how you are – that’s a most enjoyable thing to do. Give yourself time to reflect properly on where you’ve come from, why you’re here, and what you want to leave behind.